The following guest post is by William M. London, a professor of public health at Cal State LA , associate editor of Consumer Health Digest, and a consultant to the Committee on Skeptical Inquiry. 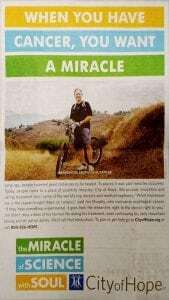 Bill brought this post, which originally appeared in Skeptical Inquirer magazine, to our attention because he knew that we listed “miracle” as one of the “seven words you shouldn’t use” in health news. We think it raises issues that will interest HealthNewsReview.org readers and we are gratefully reposting it with permission. Quite a promise! And it leads me to imagine Aretha Franklin joining health care professionals to provide oncology services of consistent astonishing effectiveness. 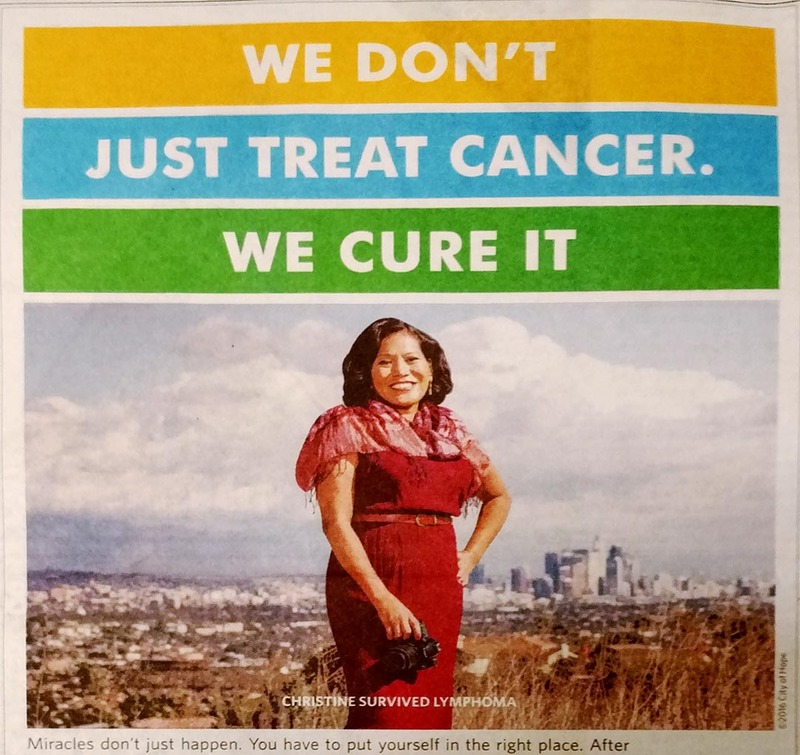 While I recognize that City of Hope offers cutting-edge cancer treatments and is a leader in making significant multidisciplinary and trans-disciplinary scientific research advances, to claim that it works miracles is disgraceful hype. In their consumer education efforts, the U.S. Food and Drug Administration and the Federal Trade Commission associate miracle health claims with health fraud. 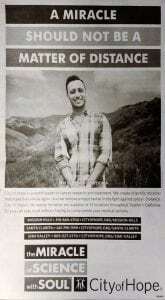 One might argue that City of Hope’s miracle mongering is mere puffery, which advertising professional Steve Cuno defined as “an exaggerated boast presumably understood not to be taken seriously,” and is therefore not deceptive. After all, many people refer to miracles loosely as wonderful events occurring against the odds. Not every fan of the 1969 Miracle Mets attributes the team’s World Series victory to a divine response to prayers, an event exceeding the productive power of nature, or a violation of the laws of nature. But a problem with the puffery argument is that many prospective City of Hope patients are inclined to seek miracles consistent with their religious or spiritual attitudes. In the 2003 National Study of Youth and Religion, 60 percent of those surveyed responded “definitely” and 31 percent responded “maybe” when asked about their belief in the “possibility of divine miracles from God.” The Pew Forum’s 2007 Religious Landscape Survey found that 79 percent of U.S. adults agreed that “Miracles still occur today as in ancient times” (as if miracles unquestionably occurred in ancient times). And according to a 2013 Harris Poll, 72 percent of U.S. adults believe in miracles. Perhaps if you set the bar low enough for what constitutes a miracle, City of Hope can work miracles. That’s what the Pope did to give credit to Mother Teresa for healing miracles. But I don’t see any disclaimer in City of Hope’s advertising to suggest that City of Hope’s alleged miracles are second-rate. See how Kommah survived cancer: CityofHope.org. Mere puffery? Or is it more like the old snake oil peddlers exploiting desperate patients? Kommah’s story is told in a brief YouTube video available on the City of Hope homepage. She explains that with the shielding of her reproductive organs from the radiation therapy she received at City of Hope, she survived her inflammatory breast cancer and went on to give birth to a baby. She had previously been told, apparently at another facility, that it would not be possible for her to give birth. An indicator of topnotch patient care? 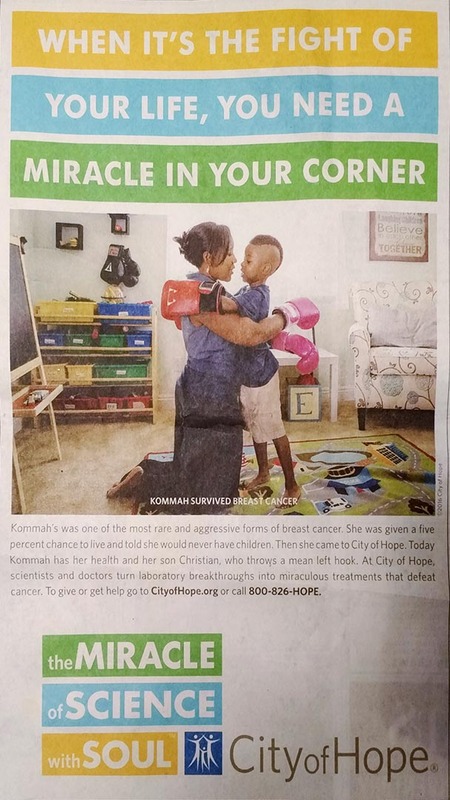 Although patients’ testimonials are often misleading, yes, I think it’s likely that City of Hope provided Kommah with topnotch care (and apparently without the mysticism-based treatments offered at some cancer centers). But providing topnotch care isn’t miraculous! Inflammatory breast cancer tends to be an especially difficult type of breast cancer to survive, but according to the National Cancer Institute: “…survival statistics are based on large numbers of patients and that an individual woman’s prognosis could be better or worse, depending on her tumor characteristics and medical history.” It’s not unknown for women with inflammatory breast cancer to give birth to healthy babies. For example, the story of a woman with inflammatory breast cancer who was treated with chemotherapy and gave birth to a healthy baby is told at the website of MD Anderson Cancer Center. Another of City of Hope’s miracle-mongering ads appeared in the Los Angeles Times (April 24, 2016). 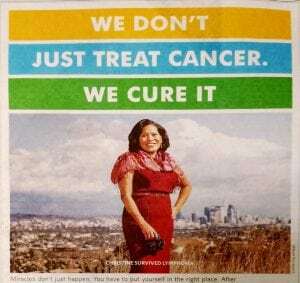 Its headline was: “WE DON’T JUST TREAT CANCER. WE CURE IT.” The message is deceptive by omission of proper perspective. Cancer is a term for many different diseases. Many cases of some types of cancer are indeed curable—and not just at City of Hope. Some cancers are not curable at City of Hope or anywhere else. 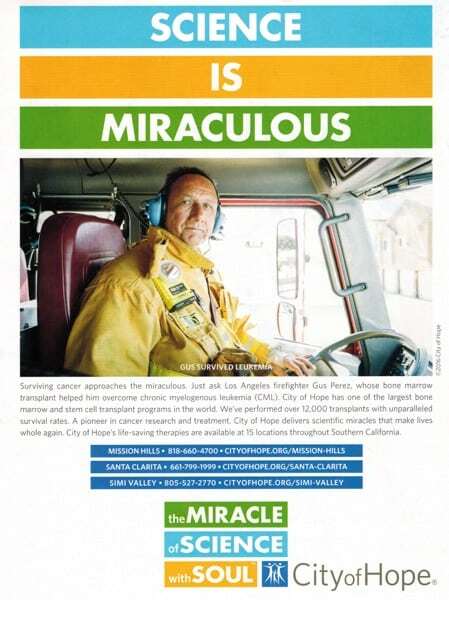 The headline, “SCIENCE IS MIRACULOUS,” in a City of Hope magazine ad is a glorification of science that obscures how science really operates. Yes, science makes progress in fighting cancer possible, but the progress has been disappointingly slow rather than miraculous. Though fallible and challenging, science is exciting, wonderful, and awesome. But scientists tend to be far too humble and too honest to claim that what they do is miraculous. Irony #2: Beliefs in miracles arise from and are sustained by misguided human tendencies that are antithetical to scientific progress such as faith, revelation, indoctrination, superstition, misperception, leniency about evidence, various cognitive biases, and fallacious reasoning (e.g., the argument from ignorance). Irony #3: Many believers in miracles as supernatural or paranormal events say that such events lie beyond the scope of scientific investigation. Some prominent scientists, science educators, and skepticism activists share this view. I don’t. Science consists of the wide range of error-minimizing investigational activities that have enabled us to understand more and more about the cosmos, which Carl Sagan famously described as “all that is or ever was or ever will be.” Anything real is part of the cosmos. If what people describe as supernatural or paranormal occurrences are real, then they are part of the cosmos. As Victor Stenger wrote in his book Quantum Gods: Creation, Chaos, and the Search for Cosmic Consciousness, “Whether any of these proposed phenomena are of supernatural origin or not, they all involve physical observations and so can be empirically studied by normal scientific means” (p. 28). Belief in miracle stories is prevalent and widely promoted. Social influences contribute to widespread credulity. Misleading accounts of miracles in mass media abound (e.g., Eben Alexander’s claimed journey into the afterlife, products endorsed by Dr. Oz, The Boy Who Came Back From Heaven, healings by “John of God,” hype for the power of prayer). Prominent individuals and organizations use media to pander to persistently prevalent delusions, exploit widespread fears, and welcome wishful thinking. Reputable scientific and medical organizations such as City of Hope don’t belong in the mass media miracle mongering business. I suspect that many City of Hope clinicians and research scientists would agree. City of Hope should be able to advertise truthful, non-misleading messages of hope. Supporting the audacity of hope does not call for the audacity of hype. It should not take a miracle for City of Hope to replace its miracle campaign. 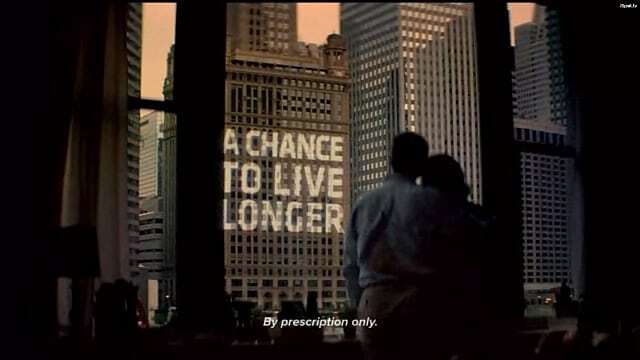 Where are the TV ads to "educate" patients about the negative Opdivo lung cancer trial? ‘CURE’ is a four letter word……intentional marketing fluff. The only people who beat cancer are those that die of some other illness…. City of Hope is hardly the only major cancer center to be hyping its ability to treat cancer in ways some would consider excessive. Here in the Philadelphia marketplace, with multiple different well-known cancer centers within a matter of miles of each other, there is what can only be described as “media warfare” between the marketing departments of such institutions as the Fox Chase Cancer Center (in Philadelphia), the University of Pennsylvania’s Abramson Cancer Center (in Philadelphia), Thomas Jefferson’s Kimmel Cancer Center (in Philadelphia), Cooper Hospital (in southern New Jersey, and associated with M. D. Anderson Cancer Center), Cancer Centers of America (in Philadelphia), and others. For greater detail, see for example this article on the OncoLink web site at http://www.oncolink.org/blogs/2016/07/cancer-center-advertising-harm-good/. Of course it’s puffery, but much of modern medicine seems to us to be miraculous. Just because it seems miraculous doesn’t make it a miracle. That’s what separates magicians and conjurers from scientists.